It’s interesting how sometimes the most random conversation can be lead to something… inspiring. One night, a good friend Liz sparked a discussion about Vanilla because she was surprised that the so called Vanilla, does not in fact look like beans at all as she has imagined. 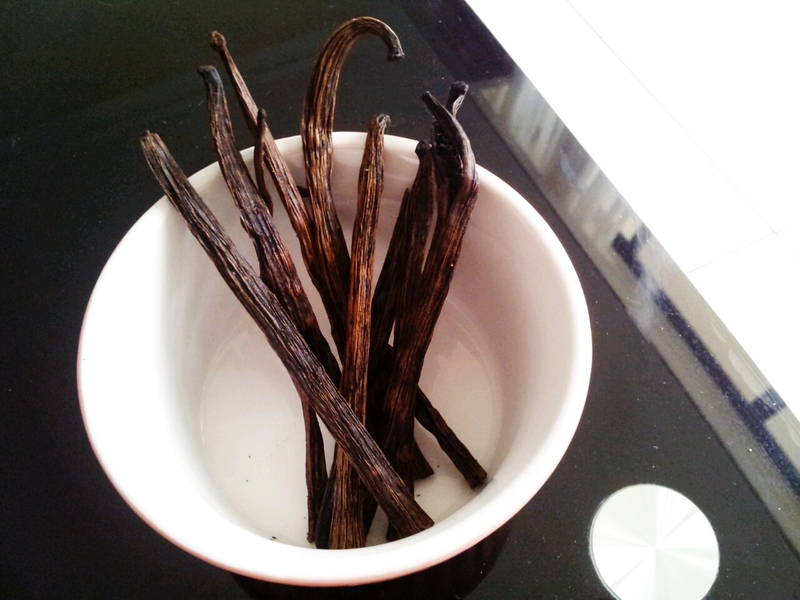 Yes, I’m talking about the Vanilla pods that resemble dried twigs. What we usually refer to as beans are actually the seeds of the Vanilla fruit, however the whole pod should be used while infusing the aroma into whatever that we are cooking/baking. The confusion is understandable because we don’t usually use the pods at home. Even though Vanilla is sometimes synonymous as “plain”, it is one of the most expensive flavouring agents. Which is why generally we only use Vanilla Extract (Vanilla pods soaked in alcohol thus the flavour is infused) or even Vanilla Essence (which is often just chemicals/imitation vanilla flavours). Anyway, that conversation was promptly diverted to a discussion of ice cream flavours. And I suddenly remembered that I have a pack of Vanilla, kindly given by Sid and wife quite a few months ago from their trip to Bali. So far, apart from throwing a pod into my sugar pot to make Vanilla sugar (ie: get Vanilla-infused-pretty-much-anything), and Crème brûlée, I have not really utilized them much at all. There’s no surprise what I decided to make that night (mind you, it was almost midnight). Late night inspirations: good or bad? I will leave you to contemplate that. So I researched a few recipes online and decided on something that does not require any ice cream maker. While making the custard, I saw my box of Earl Grey teabags and threw a couple of bags in as well. I’ve been wanting to taste Earl Grey Ice Cream for a while. The trick is to make sure the flavours are infused into the custard so make sure the pods and teabags stay in for at least 15 minutes. Without an ice cream maker, it is in fact slightly more tedious to make ice cream because you’ll have to keep stirring the liquid every now for a few hours. But I think the result is equally good! 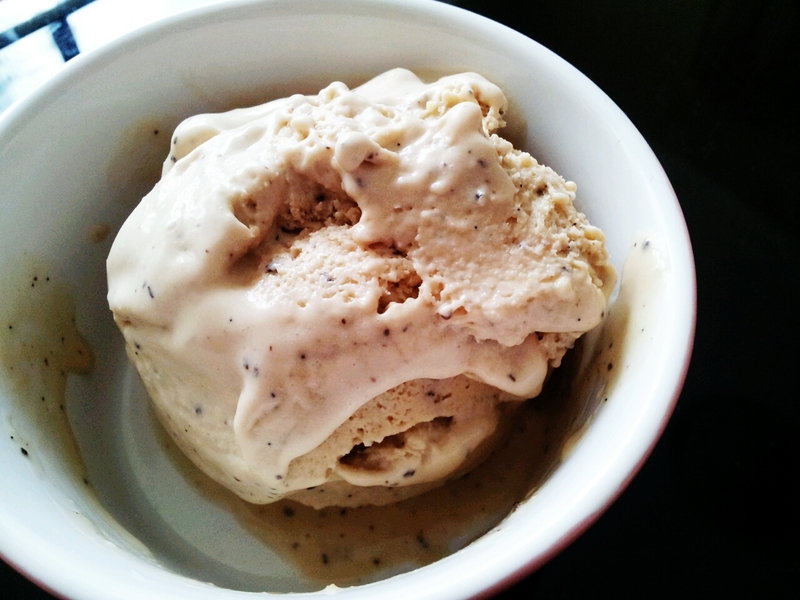 Earl Grey Vanilla Ice Cream. No ice cream scoop, so I tried my best to shape it with a spoon. Who cares how it looks though right? It tastes good! Here’s the recipe, as requested by many of you. If you don’t have Vanilla pods, use a teaspoon of good quality Vanilla Extract or Vanilla Bean Paste. Do not use Vanilla Essence at all cost. Combine Cream, Milk and in a saucepan, scrape the vanilla seeds from the pod and add to the saucepan (including the pod) and bring to boil. Turn off heat, add the tea bags and let it infuse for 10-15 minutes. In a bowl, beat egg yolks and sugar together until pale and creamy. Remove the vanilla pod and tea bags, and slowly incorporate the cream mixture (pour in a thin stream) into the egg mixture. Return the mixture to stove and bring to boil in a low heat. It should thicken slightly and the mixture will coat the wooden spoon. Pour into a container let cool for 10-15 minutes. Put the container into the freezer. Now this is the part where you have to check it every half an hour or so to stir and loosen the mixture up. This is to prevent larger ice crystals from forming. Repeat the process for about 2-3 hours, then you can just let it freeze overnight. Enjoy! Frank, the ice cream monster approved and now I have requests for all sorts of flavours. I still have a little box of Durian sitting in my freezer so I might do that next. So what’s your favourite Ice Cream flavour? Oh before I sign off, I shall share a video of my performance from couple of weeks ago at Show House, Sunway Giza. I’ll be singing there every Friday this week so if you are free at any night do come along! We usually start around 10pm. Here’s a Chinese Song for you. By one of my favourite artists: Amei. Oh ice cream is just the right thing for me in this weather….and moreover it’s Earl Grey, my favorite tea! Yummy. Mmmm. Earl grey is my favourite too for the Western type tea. Otherwise it’s green tea or jasmine tea for me. Earl Grey has a lemony fragrance and tastes lighter than Green tea. I like both anyway but I think Earl Grey is easier to accept. Wow! Like seriously wow! First of all earl grey and vanilla…that’s pretty bold. And the time… Girl..what can I say. You are born for cooking. I would have given up by 45 minutes and head to baskin robins. Having said that..nothing beats homemade ice cream. The best I do at home is chatime popsicles..LOL. Baskin Robbin’s pretty close to us but I don’t like their ice cream. Sometimes I just find a large chunk of time to waste haha. If you have a ice cream maker, you’ll save all that time. I’ve spent 8 hours on Ramen broth so this is nothing at all! Hahahah make sorbet instead 😛 No cream and use less sugar! You can use this method for all sorts of flavours! 😀 Yes I do indeed speak/read/write Chinese (Mandarin, my canto is quite poor). Wow, first home make ice-cream already looks so good! Hehe ok you busy bee! Thundarr the Barbarian was the very best submit apocalyptic collection on tv that established a precedent for my creativeness. The earth was torn aside by a rogue comet that arrived between it and also the moon. A brand new globe emerged in the ashes of outdated. [Giovanni Venosa] was among the no-name cast assembled by director Matteo Garrone for his mafia movie Gomorra (2008). Once the movie was proven to true Gomorra members imprisoned in Naples, they recognized him as among them — it turned out that Venosa was a needed structured criminal offense figure using a appreciate for performing. He experienced attempted out within an open audition and received a role. 9999 The perform you have achieved has gotten you this far. These station replica handbags in many cases are the clone for the authentic exquisite channel totes.